This session is based on the previous session - Part 53 Reflection in C#. Please watch part 53, before continuing with this session. In this session we will develop a simple winforms application. Please design the form as shown in the image below. Now double click the button control to generate the event handler. Copy and paste the following code in the button click event handler (btnDiscoverTypeInformation_Click). Run the application and enter the type name for which you want to find type information. 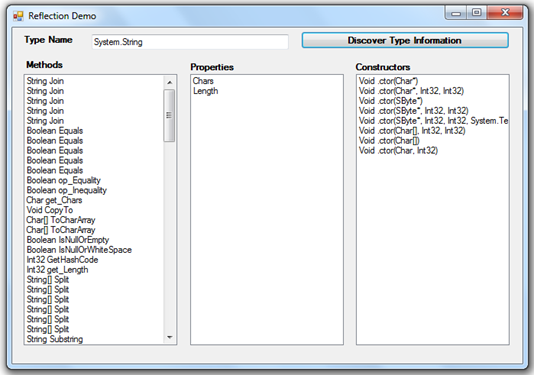 For example, if you enter System.Console, you should see the list of methods, properties and constructors. Can I use Reflection to do the introspection of an external class to my project?